Do yourself a favor and ask your butcher to supply duck legs. They're a better value than breast or whole duck, and very simple to cook. You can serve one as a first course, or two for an entrée. This recipe can be easily doubled, just use a large roasting pan instead of a skillet to cook the duck after browning. 2. Season the duck legs on both sides generously with salt and fresh ground black pepper. 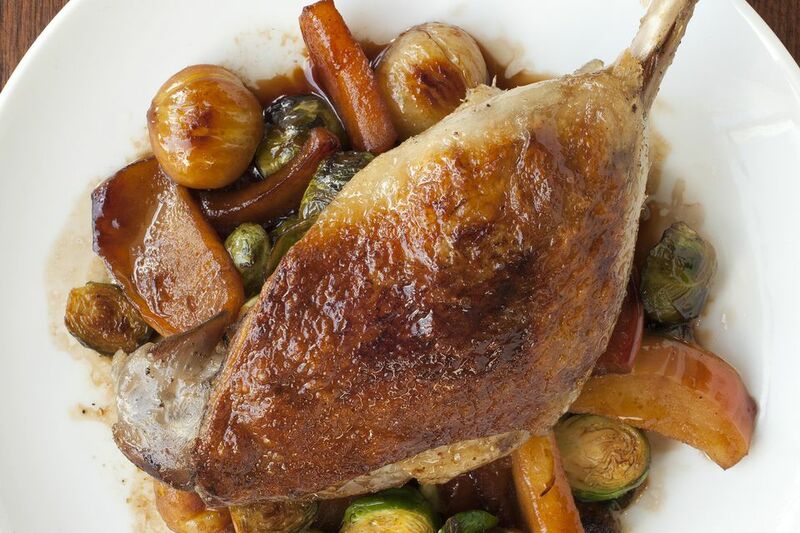 Heat the olive oil in a large oven-proof skillet, over medium flame, and place the duck legs in, skin side down. Cook until the duck skin is well browned, about 6-7 minutes. Turn over and brown the meat side for 3 minutes. 3. Remove legs to a plate, pour off the excess fat, and add the vegetables, garlic, and thyme. 4. Roast for 1 hour and 15 minutes, or until the meat is almost fork tender. Uncover, and turn the oven up to 425 degrees F. Roast another 20 minutes, or until the duck is tender and the skin is crisp. Let rest for 10 minutes before serving topped with the apricot sauce. 5. For the Apricot Sauce: Add the preserves, rice vinegar, and water to a small saucepan. Bring to a simmer, stirring, over medium heat. Remove from heat and stir in the thyme, black pepper, and salt to taste. Serve warm or room temperature.